Pottery, relief, 0.5L, pewter lid. Central image taken from a painting by Friedrich Prölß (1855-1934). See also Nos. 319, 330, 333, 355, 382 and 400. 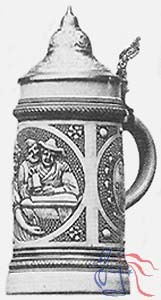 Copyright © 2003-2019 Beer Stein Library — All rights reserved.